So the AI decided to activate Maze of Ith on its own attacking creature before passing priority during Declare Attackers. Could the AI be set to never Maze of Ith its own creatures? Ldcs8T4EAnj8h5ZMD8rf wrote: So the AI decided to activate Maze of Ith on its own attacking creature before passing priority during Declare Attackers. Could the AI be set to never Maze of Ith its own creatures? The thing is that there are legitimate reasons to use Maze of Ith on your own creatures, though not in this situation. You can use it to save an attacker that gets a nasty block, for example. When AI has multiple creatures and I have Mortician Beetle or Blood Artist or Quest for the Gravelord, if I send them Jinxed Idol, AI will keep sacrificing creatures in response my card's ability triggering. Then AI has 0 creatures and triggered jinxed idol multiple times. No idea what was going on here... playing Quest Mode against Dungeon Crawling (Gold), and then for two turns in a row, he tapped out for no reason I could discern. Before the third turn I killed the Esper Stormblade, and he didn't tap out. Looking in the log, you can see him tapping all his mana sources, picking colors, and even taking damage from the Grand Coliseum, but why? There's nothing in play, or in exile, or in his graveyard he could be paying for. I guess it could be something in his hand.. if so, shouldn't the log tell me what it was? Recently I found the AI considering Timberwatch Elf poorly. 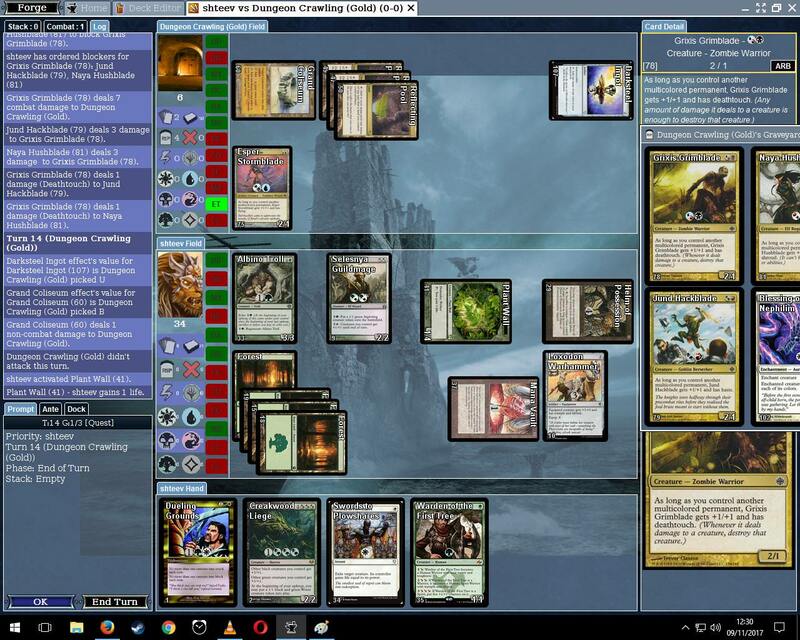 I had a bunch of elves, including a Timberwatch Elf, my opponent only a single medium creature. I attacked with a 'small' elf to lure my opponent into a block, worked perfectly, so I activated Timberwatch Elf to easily destroy the blocker. Though this was pretty obvious, I could repeat the same manoeuver next turn with another opponent creature (happened in several 'Constructed' matches). My Forge version is 1.6.4. When AI uses Jace, Cunning Castaway, he triggers the second ability once to generate an illusion, but on subsequent turns he uses no abilities at all, when he could be triggering the first, even if it has no effect, just to increase the number of counters on it. Come to think of it, I think I've seen Huatli, Dinosaur Knight doing the same thing... um... maybe... I'll come back to that one. AI does not tap Lightning-Rig Crew in response to playing a pirate. AI blocked my 2/2 merfolk with his 2/2 merfolk. He then cast River Heralds' Boon, pumped his merfolk up to 3/3, but he also pumped my merfolk up to 3/3, so they both died. The AI never casts cards that put -1/-1 counters on creatures you control, for example Baleful Ammit, Crocodile of the Crossing or Channeler Initiate. (Even when it has more than enough mana). AI is not using Spires of Orazca to untap my attacking creatures and protect itself from damage. I attacked repeatedly with a single flying creature and the AI took damage knocking his life total down, then when he became low on life he chump blocked with his own flying creatures, and then when he ran out of those he took lethal damage and died. Playing a Sixth Edition Draft tournament against AI. Turn 1, AI cast Blood Pet, Sacrificed it, used the mana to cast Bog Rats. AI used Aerial Guide to give Flying to a creature that already had it, rather than a different attacking creature which didn't.